Accurate Tool and Machine is a diversified machine shop committed to customer satisfaction and reliable on time delivery at competitive pricing. Our goal here is to give you the best quality tooling possible. 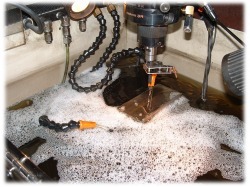 The facility is very well rounded in its machine capabilities. We can perform small volume C.N.C. lathe and milling work as well as precision form grinding and cylindrical grinding to compliment our conventional EDM machines.